Do you have too prominent ears that are always ‘sticking out’? These ‘flap-ears’ are resulted from the construction issues found in the ears, which starts emerging as one grows, if not in the early years. But the worst thing about having such protruding ears is that they can cause embarrassment, low self-esteem, and psychological distress to a huge extent. Moreover, they are equally discomforting for both adults and kids. Hence, if you want to get your ears reformed for a more pleasant look, otoplasty can be your solution. Go through this article to know more about otoplasty and make a well-informed decision. Overdevelopment: The outer ear has an overgrowth due to the presence of several cartilages in it. Underdevelopment: The outer edge of the cartilage, which is found at the top of the ear, does not fold towards the head well due to improper development. Angle: The outer ear sticks out from the side of the head at an angle more than 35 degree. Injury: Sometimes an injury can also make an ear protrude out. Heredity: Almost 30% of newborns have congenital ear deformities, which appear unusual in the first 3 months. Most of these are self-correcting and get fixed in a week post-birth. Otherwise, a non-surgical correction or an otoplasty is required. ‘Otoplasty’, also known as ‘Pinnaplasty’ or ‘Ear Pinning’, is a reconstructive cosmetic surgery that aims at rectifying the existing deformities in the outer ear or ‘pinna’ and improving the overall appearance of the organ. It is a less complex surgical procedure, which can be performed in one ear or both ears as required. Whether it is a congenital deformity or accidental injury, otoplasty reshapes or resizes the outer parts of ears to repair even the most minor concerns and boost the confidence level of the person. However, as pinna has no major function in our hearing, the procedure does not impact our hearing in any way. 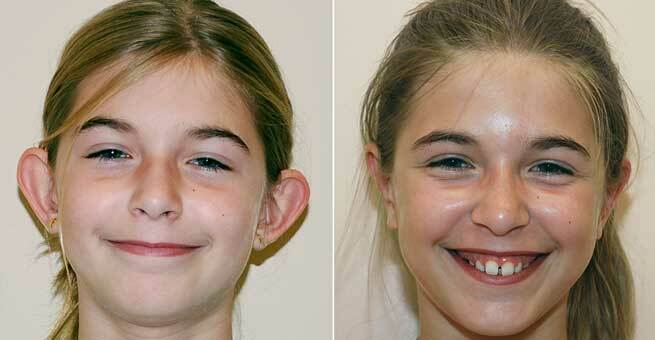 While adults can undergo otoplasty surely, the procedure can also be performed on kids as young as 2 years. However, it is important to delay the surgery up to the age of 6 years so that the ears can be more developed and become full-size. One also needs to have a good physical health in order to get the shape and appearance of their ears corrected through the surgery. In kids, the procedure is performed under general anesthesia while in youth as well as adults, IV sedation supplemented with local anesthesia is used. The area of the outer ear on which the surgeon will work is outlined precisely. This helps carry out the surgical procedure efficiently. An incision is made on the cartilage behind the ear exactly where the organ joins the head and creates a natural fold. It ensures that only a thin scar will be left, which will be barely noticeable. The cartilage and skin in the traced area are scored and reshaped in order to reset the angle of the ear and bring it in better proportion with the head. For this, a hollow needle is inserted into the backside of the auricle and the cartilage is repositioned or remoulded. Sometimes, it is simply trimmed and pinned back as per the requirements. Once everything is done, the incision is closed with permanent and dissolvable sutures to hold the ear in its proper position until it heals and preserve its natural appearance. Typically, an otoplasty surgery takes approximately 1-2 hours depending on the changes need to be accomplished. Before you are discharged, the head is wrapped with a fluffy bandage so that the ear is protected and the cartilage is secured in its new position. Make sure that your head is elevated even also during the sleep. Try to keep your head as much cool as possible (avoid everything else that could heat it up). Keep the bandage intact and skip washing your hair for at least 1 week. Wear a tennis headband f(loose yet supportive) or 2 more weeks after the removal of the bandage. Resume your regular activities including workout after 5-6 weeks. Stay away from swimming for at least 8 weeks. No physical contact sports should be practiced up to 3 months. The cost of otoplasty covers the surgeon’s fee, operating room fee, anesthesiologist fee, and all follow-up visits. Generally, it ranges from $3,000 to $6,000 based on the requirements of the patient.